Covering an area of 3,000 square meters, the Porcelain House is decorated with 400 million pieces of ancient porcelain, 16 thousand pieces of ancient chinaware, 300 white-marble carvings, and 20 tons of natural crystals. The whole transformation is rumored to have cost Zhang Lianzhi approximately 2 billion yuan ($315 million). 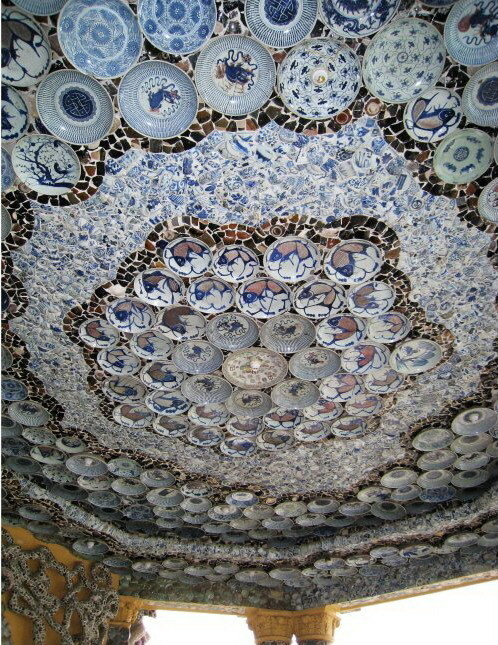 About 80 percent of the porcelain used to cover the house comes from broken or damaged antiques, but the eccentric collector mixed up the different fragments and pasted them on the walls in such a way to conceal the damaged parts. In fact, most of them look intact. The courtyard wall is covered with around 3,000 porcelain vases, and is called name “Ping’an Qiang” (Wall of Wellness). Zhang, a successful businessman with an interest in art and culture, made sure elements of Chinese culture could be seen at every turn of his Porcelain House. Perhaps the most impressive are the four “China dragons” entwining the exterior wall of the building. Each dragon is more than 200 meters long and is pieced together from thousands of porcelain pieces. They symbolize the power of ancient China and are one of the most dominant features in Chinese architecture. But while the porcelain-covered exterior of the edifice shines in the sunlight, capturing the attention of passers-by, on the inside porcelain is only used to decorate the part of the ceiling, the rail and the doors. Zhang Lianzhi was born into a wealthy businessman’s family in Tianjin and has a profitable Cantonese-style restaurant chain. Over the past 20 years he has constantly expanded his collection of which antique porcelain makes up the majority. One of the latest additions is a functional Land Rover covered with approximately 10,000 pieces of antique ceramics. It’s estimated worth is 1 million yuan ($160,000).